The school year is finally done––with final grades locked and submitted––and with its end I can get to work on getting Long John up and going so that you can see Chapter 3, “Making Smoke.” But that doesn’t mean I haven’t done stuff in the meantime, either. Growing older is a very strange experience, because it happens in real time. I realize that’s as banal a statement a person can make, but it so accurately explains my response to seeing fictionalized versions of events that happened from when I was alive that are coming out now. Part of youth is to figure out the context in which you’re existing, so you learn about historical events and important people: you learn about World War II and the Beatles; you are told Citizen Kane is the most important movie in the world and are shown pictures of the Civil Rights movement. While absorbing this information, though, the world keeps happening around you––it’s not waiting for you to get caught up. To that end, a lot of the stuff that happened since my birth was given less cultural weight (in my mind) because I thought that all of the important stuff happened before. I think the first major news story I remember is the Tiananmen Square protests, specifically the man facing down the tanks in the square (apparently referred to as “tank man“). I remember seeing that and thinking, “is this going to be history?” which seems like a line an android would ask as it verges on sentience. After that, I remember the fall of the Berlin Wall, and then the Lorena Bobbit incident, and then, I think, the next major event I remember would be the attack on Nancy Kerrigan. My mother is an avid fan of ice skating and this scandal was of particular interest in our household. But I was still a kid playing video games and slowly learning how to engage with the world; so, while I remember it, I didn’t absorb it. Like the first season of American Crime Story, subtitled “The People vs. O.J. Simpson” (combined with the the long but outstanding 30 for 30 documentary, O.J. : Made in America), which told me what I already knew but also put it into a context outside of headline reporting––filling in details that actually showed that it was a series of gears and cogs that all fit together––I, Tonya does a fantastic (and often hilarious) job of taking the story back from the sensationalist and sound bite plaque that stuck to popular culture. 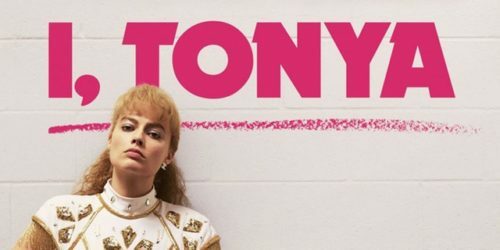 More importantly, both I, Tonya and American Crime Story are, essentially, historical dramas. Teens of today are watching these the way I watched All the President’s Men or something like that. My childhood is history now and, in terms of actually learning the details and appreciating their depth, I’m glad it is. I am a fan of the X-Men––a particularly devoted one more for its message than its narrative, at times. And while the Deadpool character comes from the X-family, I never held any fondness for him. His rise to comics stardom occurred while I was away from the medium, and by the time I heard that Deadpool was the hotshot, bad-boy character of Marvel comics, I was shocked by the news. To me, up until that point, he was just a cocky and sarcastic villain. The line from that to self- and meta-aware comedic anti-hero seemed impossible. That being said, his current proliferation in comics (being the hot property, he has more than a few books going at once and shows up as a team member in as many other books, which was Wolverine’s problem in the ’90s) was unappealing and I largely ignored him. However, I was charmed by his first movie. A lot of the jokes fell flat and the story did kind of drag on multiple viewings, but Ryan Reynolds’ charisma was undeniable and, considering the fact that the version of Deadpool they were adapting was the fourth wall-breaking, pop culture referencing loudmouth, that they were able to actually pull it off in a movie impressed me wholly. Due to the appeal of the first movie, the producers sweetened the deal for me by announcing that more characters from the comics would be in the sequel, specifically Cable, Domino, and Shatterstar. To be honest, I don’t hold any more value to those characters than I did for Deadpool, but the lot of them (Deadpool included) hit me right in my nostalgia. Part of what got me to see Deadpool was that it was a character from my youth, when I started reading comics in the early ’90s. But the character had changed so much, I went not for the nostalgia hit as much as I heard it was an okay movie. However, with Deadpool 2, simply seeing all of these characters in the trailer had me hooked like a fish on the line. I didn’t even care if it was good, the pure glee of seeing these characters lovingly rendered on screen was enough to get me to buy a ticket. Luckily, the movie is really good (in its kind of crass, vulgar, and sometimes stupid way). For me, it’s better than the first movie. It doubles down on an emotional story without getting too schmaltzy. Its action (and characters!) are more numerous and well-written. And it’s actually funny––I didn’t notice any jokes falling as flat (or at all) like many did in the first movie. I will admit, though, that as much as I loved the self-aware irreverence of the first movie, that was the part that cut deepest for me in the second. Without spoiling anything, I have to go into my next viewing understanding that this movie cares nothing for my nostalgia and it doesn’t owe anything to me. I treated these characters and stories with an undue amount of gravity and importance in my youth though I see now they were mostly just silly and a bit stupid. But my nostalgia has a hard time letting go. With hope, I can just numb that pang while laughing through further viewings. I got restocked on Volume 1, so it is on for the 3-book bundle (for a mere $20)! If you’ve been waiting on getting the books or thought buying them would be too expensive, worry no more! 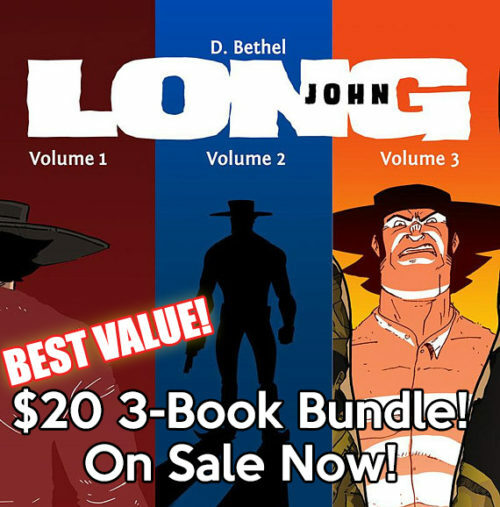 This is an absolute deal and is the easiest and cleanest way to get all three books into your hands as quickly as possible. I’m actually going to throw some marketing behind this bundle with the hopes that it’ll get out there for even more people to see. Also, if you already have the previous two volumes, Volume 3 is already for sale on the store for $8! Every purchase comes with an original Long John sketch by me as well as the classic Long John bookmark. One of the most daunting parts of Chapter 3 had to do with choreography. Not in terms of dancing, kind of, but in the violent dance of an action scene. Fight scenes are always tough because you really have to plan them out, which is the same for filmed fight scenes––it’s just with comics there’s less of a chance of someone getting hurt in the process. 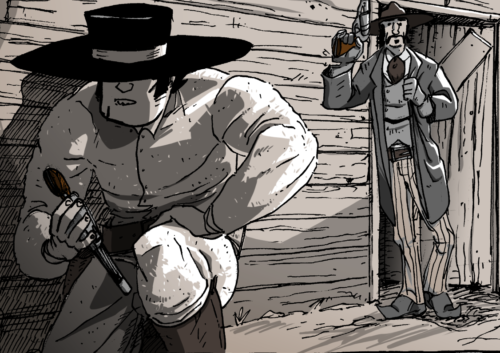 Chapter 3’s centerpiece is a big gun fight that I’m sure some people have been waiting a long time for. For me, I’m rather proud that it took me 70 pages to get to a gun fight, but when you get there I hope it’s worth the wait. Until next week, that was The Week.